One of the most enduring images of World War II, Associated Press photographer Joe Rosenthal snapped five Marines and one Navy corpsman raising the American Flag on top of Mount Suribachi during the battle for Iwo Jima. 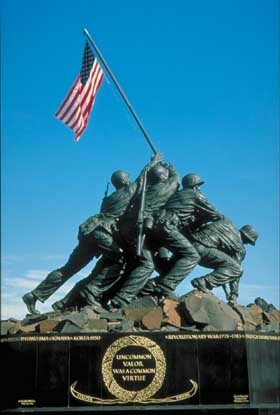 While many people refer to it as the "Iwo Jima Memorial" the statue is in fact the United States Marine Memorial. 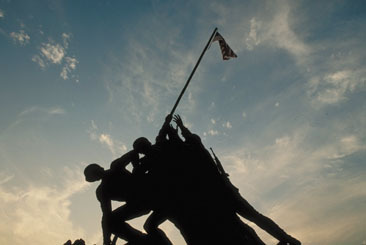 Rosenthal's Pulitzer Prize winning photograph was selected to represent all Marines near Arlington National Cemetery. The 32-foot tall cast bronze statue was designed by Felix W. de Weldon and formally opened by President Dwight D. Eishenhower in 1954.
for fighter planes and to provide an emergency landing site for B- 29 Superfortresses attacking the Japanese mainland. With the first waves landing just before 9 a.m., the Japanese struck back at 9:15 a.m. and the battle was on. Iwo Jima would be a different, and very bloody battle, for the United States. American troops were used to Japanese banzai attacks, massive frontal assaults, that were usually broken with massive American firepower. At Iwo Jima, Japanese commanders formed intricate defensive positions and miles of underground tunnels. The Marines would literally have to fight for every inch of the volcanic Pacific island. The island's volcanic ash bogged down Marine infantryman trying to cross the beaches. Heavy anti-tank mines destroyed landing craft and tracked vehicles as they came ashore. Mount Suribachi was one of the first objectives as the Japanese could pour fire directly on the landing beaches. Japanese defenders created fighting positions in caves and small holes on Suribachi. Most Japanese soldiers had to be killed at close range or burned alive with flamethrowers. 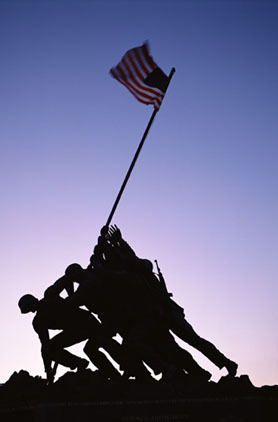 Even to this day, many people think the Iwo Jima flag raising was "posed". In reality, Rosenthal's photograph wasn't the first flag on top of Suribachi, but neither was it posed. Film footage of the first flag coming down clearly shows Rosenthal's image as it happens. The U.S. Government jumped at the image to sell war bonds and promote the war effort, inducing citizens to think the famous flag raising was under fire. During the summer months, the U.S. Marine Drum and Bugle Corps stages its Sunset Parade each Tuesday from 7 p.m. to 8:30 p.m. The parade is free to the public. The United States Marine Memorial is located on Marshall drive next to Arlington National Cemetery in Arlington, Virginia. The Memorial is open 24 hours a day and free to the public.